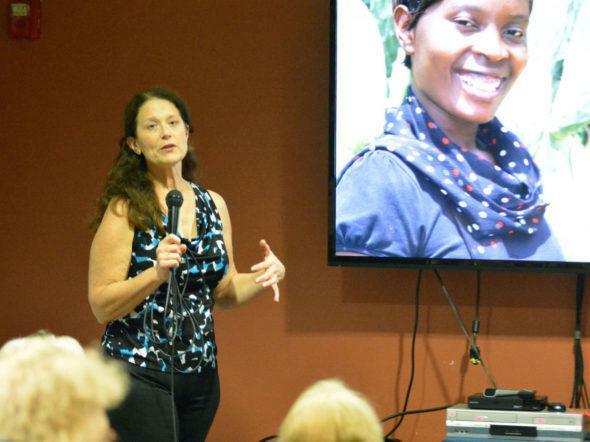 Dr. Marjorie Heier is used to giving presentations on her medical mission in Zambia, where she's lived since 2013. But she seemed a little nervous in front of a packed room Monday afternoon at The Heritage at Meridian Gardens because of two attendees ó her parents Chuck and Pat Scheuneman, who live at the local care facility. Heier, 55, grew up in Columbus and Schuyler and spent more than 20 years working in rural clinics in Nebraska. After her three children grew up and moved away, Heier went on a short-term medical mission to Bolivia with her daughter. Later, she had an opportunity through her church to do the same thing in Zambia through Gospelink Inc., which founded the International Bible College of Zambia in 2005 and the Chifundo Clinic to care for Bible College students. When I went I was thinking it'll be like semi-retirement I'll get up late in the morning, take care of the students, climb a mountain in the afternoon, she said. ìIt didn't really work out that way. When she arrived in the African country, she saw how great the medical need was in the community and surrounding rural villages. The number of patients seen per month went from 250 to 2,500. As early as 3 or 4 in the morning, people start coming,î she said. And most people there by 7 will be seen that day. Heier said her experience working in rural Nebraska applies directly to her work in Zambia. ìIt wasn't too unusual to figure out how to ship people for higher levels of care,î she said. You're used to working alone at night. Rural medicine in Zambia and Nebraska have a lot in common. Its different, but similar. After two short-term stints in Zambia, Heier committed to a long-term medical mission in 2013. Sheís spent 11 months of the year working with the clinic and college since then. Now medical director of the clinic, Heier is overseeing the clinics expansion and laying the foundation for its future. One of the biggest projects that is currently underway is a significant expansion of clinic, which will more than double the square footage and add more specialized examination rooms, such as those for X-rays, and inpatient care. Meridian Gardens residents may already be familiar with her mission since the assisted living facility donated the library chairs and tables to the clinic when the Columbus building was remodeled. Those chairs and tables will be used in the conference room where international medical volunteers train Zambian medical students and staff. Through that training, Heier said the best medical practices can spread to clinics across country and improve quality of care. In addition to the newer, larger facility, other structures are also in the works, including a shelter for people waiting for care and waiting house for expectant mothers to reduce the number of birth complications in transit to the clinic. The Bible College, as an educational facility, is also helping lay the foundation for the clinic and other community health projects to be facilitated and run primarily by Zambians. The college was built to formally educate ministers to preach the Gospel. But in addition to training ministers, Heier said all students are expected to learn some kind of trade while at school. Some guys work in the clinic and they learn medicine, some guys work in poultry and learn chickens, some of the guys work in the gardens and work maintenance,î she said. ìThe philosophy to equip them with skills to still be able to carry out the ministry but still be able to support their family. The clinic and college have also partnered with congregations and other organizations to address some of the roots of the health issues through better nutrition, clean water, sanitation and agricultural programs. The ultimate goal is to have the clinic and college be run by Zambians. Heier presented slide after slide of Bible College students who have returned to the college or will return to work in the clinic once they receive further training to serve as doctors, nurses, dentists and community health professionals. Our goal is to bring in the people to take over the different pieces and give them the training they need so that they dont need me anymore,î she said. Click here to read the article on Columbustelegram.com.